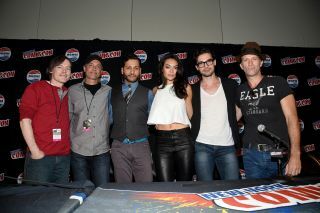 The cast of SyFy Channel's The Expanse science fiction TV series pose for a photo at New York Comic Con 2015. NEW YORK — Fans at New York Comic-Con got an immersive look into the SyFy Channel 's epic new TV series "The Expanse" in more ways than one: with a Q&A panel and screening of the first episode as well as with a Google-Cardboard-powered 3D tour of the show's spectacular spaceships to take home. As con-goers entered the panel yesterday (Oct. 8) they received flat, plastic-sealed packages which could be folded into Google's quick-and-dirty 3D viewer made of cardboard, Velcro, a magnet and some plastic lenses. The app came from a partnership between Syfy and NBCUniversal Media Labs, according to the press release, and used materials from the show's visual effects department to make sure the views were authentic. The app can display in 3D — which follows users' head movements as they look around — or in ordinary 2D. This is likely not the last of the 3D viewer's vistas: "The Expanse" is rich with intriguing locales. The show takes place (in part) on spaceships, a futuristic Earth and the asteroid Ceres — where gravity varies with depth within the spinning colony and members of an underclass are rising to rebellion. The interplay of the different factions, in very different locations, will drive the action of the show. And now, sci-fi fans can get a first-hand glimpse of some of those settings with just a cardboard set of goggles (or even a pizza box and some spare parts — Google gives DIY-ers directions to build Google Cardboard from scratch). You can download SyFy's "The Expanse" VR app at Google Play or iTunes.